Willie - that's a great idea about the boat trailer. Even in Colorado a lot of people have boats. A lot of them also have boats they are trying to unload. You may need to deal with a leaky boat to get a cheap trailer. It gave me another idea - What about getting a couple axles and wheels like you would see on a garden cart or something, and build some kind of frame to mount the collector and the wheels to? You probably couldn't tow that down the road, but probably could roll it around by hand. Don't know if it would need to steer. 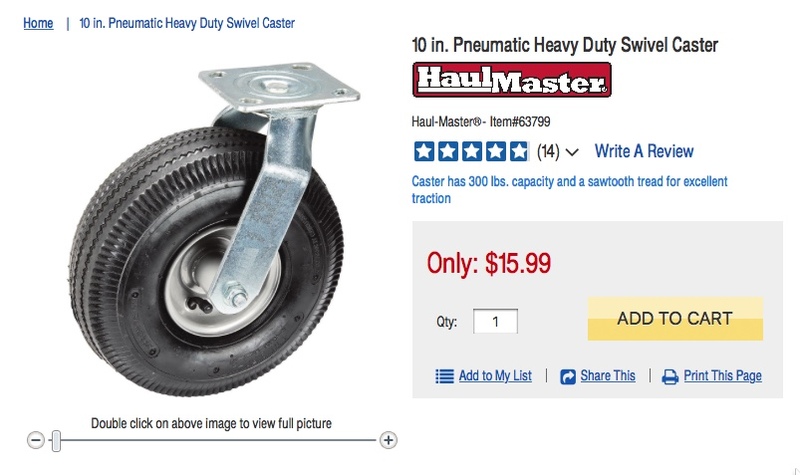 Maybe only one axle with a drop-down foot (like on a real trailer). We get a lot of wind here, so you would probably need some way to stake it down. I mounted a single 10" caster on the bottom edge of my panel sections. I bought them at Harbor Freight for about $10 each on sale. You can get them either fixed or pivoting. They are hard to handle when moving the sections with only the single wheel. But if you used two wheels, with one being fixed and the other pivoting, a single person could easily move a collector in and out of position, provided the winds are light. The original 1955 natural gas furnace was replaced by me about 15 years ago. It must have been an early forced air unit as it consisted of a single large flame shooting into a barrel within a barrel. The heated air moved between the two barrels. I replaced the furnace myself with a clearance 95% efficient unit I bought on clearance at HD. My home audit showed it to be even higher rated than the stated 95%. In any case it is probably twice as efficient as the old unit. The intake and exhaust on the new unit consist of two 2" PVC pipes. I actually thought about dense packing cellulose into the walls of my house. But the audit showed that the walls already had what looked like either very early fiberglas batts or perhaps spun rock wool. In with case it would have been tough to pack the walls evenly. As it is now have a 1" thick thermal break, in addition to the house wrap. Yeah, I've seen the articles on BuilditSolar too. That would be a great project. It doesn't look unreasonable to build, and surely a lot cheaper than the commercial units. Some of the high-end manufacturers tout the efficiency of their units, but still... I wonder if the cold intake issue could be partly mitigated, at least during the day, with a passive, low-resistance solar pre-heater. I think Kevin H did something like that at his place. You'd probably want some kind of bypass during warmer months. Or else just turn the HRV off and open some windows. Don't know if you have AC. I'm really lucky living where I do; I've never had AC or even thought I wanted it. One of the authors of the 1980's Canadian design was the late Rob Dumont, one of the early pioneers of the super-insulation movement. He was one of the designers of the 70's Saskatchewan Conservation House. That was sort of a research project, and may have had a few 'aesthetic' shortcomings to some eyes, but it did prototype a lot of good ideas that have since become more mainstream. There are some interesting articles on Rob's own house too (one is reprinted on BuiltitSolar). Yes, I did a pre-heater for the air exchanger (2013, time flies). I used to run the air exchanger during the day on the 20 min on / 40 min off cycle. A new house was just built next door so now it gets shaded most of the day. After seeing how things go as the sun gets higher I will be deciding whether it is worth while doing solar heating any more. An air exchanger also helps in the summer when using the air conditioner. The warm air coming in is cooled a bit by the house air exiting.